Tag Archives: Fab or Fad? Fab or Fad? Crystal Hair Extensions! In summer of 2011, feather hair extensions were all the rage. As summer approaches us again, we begin to wonder if they will make their second debut in 2012. Some people believe they will, while others are rooting for crystal hair extensions. Crystal hair extensions are extension made of a few crystals connected together by a thin strand. The strand often blends into your hair and you are left with a line of small crystals spaced evenly down you hair. They usually attach magnetically at the root of the hair. Unlike feather hair extensions, you have to remove them at the end of each day. These hair extensions can also be a unique hair accessory for a wedding or other special occasion. 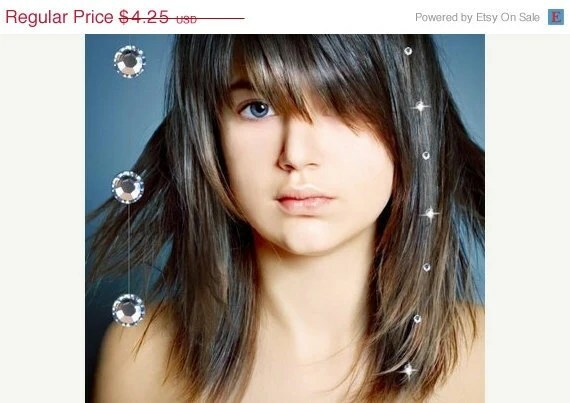 I found these crystal hair extensions on etsy.com. Click here to view this product in more detail. We all remember Lauren Conrad’s dip dye hair post on her blog from last year. Besides Lauren, I did not see many people try this trend in 2011. But as summer of 2012 is approaching soon, it seems that the trend is about to pick up some steam. I have already seen a few girls from school and on the street sporting the dip dye hair trend. The best part of this trend is that even with permanent hair colour there isn’t that great of a commitment. When the trend blows over, all you have to do is get your ends snipped off. If you are looking for a more temporary fix to this trend, there are several alternatives for that as well. There are temporary hair colour sprays that come with an inexpensive price tag at the drugstore. Click here to watch a video of Kevin Murphy demonstrating how to apply his new product.